Every child is a sign of peace for this world! From caring for a baby who is only a few days old to supporting the development of a mentally disabled child up to supporting young adults to build their own future; as a loving family, our Children’s Home cares for every single child according to his or her special situation. Everyone has his own story which is worth being told. Our social worker, Jeremiah Mbulamani, and our volunteer, Mirjam Fritz, are writing to you about Kawu Alfred, Asero Betty and Eduwan James Peter to give some examples of the large variety of our family members. Kawu Alfred was brought to SALEM Babies and Children’s Home just 8 days after the mother died from delivery on the 20th-August 2015. The father had a mental break down shortly after. This forced the old poor grandmother to take the responsibility to take care for the baby and other siblings. Like many children received in the children’s home Kawu Alfred was under intensive care and was monitored by our house parents. The baby reached 10 months this May 2016. This has not been one man’s efforts to see a child growing in good health, but has been a collective effort starting from the sponsors to the last person in the home. Alfred like any other child is able to react to different sounds, to eat and drink normally. He enjoys the company of both children and adults. SALEM Babies and Children’s Home lives and works as a family. Our joy is to see Alfred cerebrating his 1st birthday on 20th-August-2016. 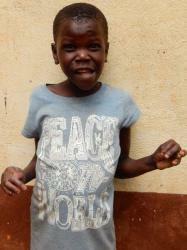 When Asero Betty was brought to our Children’s Home she couldn’t talk or walk even though she was five years old. Born as a healthy child, she developed a mental disability due to the mistreatment of her mentally disabled mother and malnutrition. Her caring Aunties in her new home supported her with special training so that two years later she had learned to walk and could even speak a few words. Her good development made it possible for her to start attending our Nursery School in 2014 which was a great improvement. But still her situation is not an easy one. She needs special attention which is not easy to handle for our committed teachers who already have large classes of talking and bustling young children. As a volunteer in SALEM, I have the capacity of spending time only with her which is not possible being a class teacher. Together with the social worker, who has an extensive background on special needs education, I highlighted some aims which could be the next steps to concentrate on for her development. When we started our training she never went to the toilet or even communicated if she needed to ease herself. 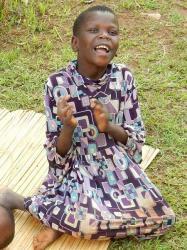 Trying to teach her to use a pit latrine, it seemed as if she were scared to enter the room. Now – nine weeks later – she not only enters the room when she is told to, but also communicates when she has the urge to go, and even washes her hands afterwards without being told to do so any more. The next step w ill be to teach her how to crouch as, for now, she just sits down on the dirty ground. Being physically still underdeveloped, some small exercises shall help her to gain consciousness about her own body. Most of her movements still seem to be a bit clumsy. Balancing on benches, catching and throwing a ball, touching different parts of her body (“head, shoulders, knees and toes”) helps her to slowly develop a consciousness about the different parts of her body and how to use them depending on her own intentions. Even if it sometimes seems as if she is abstracted and not listening, she understands a lot and most of the time she does what she is told. But conversations were only one sided. She hardly talked and never used any signs to communicate what she thought or needed. Being asked to repeat something, she silently moves her lips in the right way. After realizing that she is being listened to, she started to sometimes communicate non verbally. For example, when she needs to go to the toilet or when she wants to go back to her class or if she wants me to look at something she has drawn she will raise her hand. Up to now the situations in which she speaks out loud are very rare. If she is in a good mood, she starts repeating some of my words or calling me by name to get my attention. Those special moments show that physically she is able to use her voice. I am very sure that after realizing what she can achieve when communicating her needs, she will start using this method of being heard. Betty still has a long way to go but even after those few weeks you can see a big improvement of her absorbing and reacting to her environment in a sharpened way. 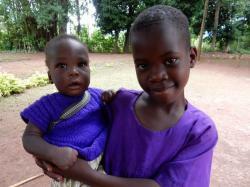 She likes being together with other children and being part of a group. Step by step she will go her own way. Eduwan James Peter was admitted to SALEM Babies and Children’s Home on the 24th-May-2004 while he was only 9 years old from Ogiino village in Kumi district, eastern Uganda after he had lost his mother, the late Loy Alupo, who died in 1998. The father was a drunkard and very poor, and SALEM found him malnourished, not attending school and the family was completely helpless, living in semi permanent grass thatched houses. His stay in the babies and children’s home was a blessing to Eduwan because he was assured support of the basic needs like food, shelter, medication, education, social and psychological support from the organization. 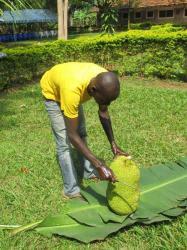 At the age of 19 Eduwan James Peter has full grown with the support from SALEM Uganda. His chances for survival and for education were very minimal but through the support from Germany now he has been able to study from one of the good schools in Mbale. At the moment he is in Senior Four (S4) and will be receiving his final Uganda Certificate of Education which determines whether he can go to a professional course and to advance to another level. With a smiling face all the time, Eduwan James Peter is a promising child academically. 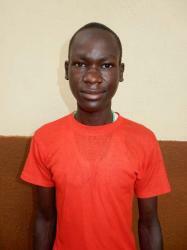 The social worker, Mbulamani Jeremiah, recently visited him at school on the 9th-04-2016 to see how he was progressing in the school and he was impressed with how well he performed on the midterm. The social worker had a chance to meet with his teachers to discuss his academics and pledged to continue supporting him in all subjects. With all the boldness Eduwan James Peter is known for, he will attend a university to fulfill his dream of becoming a doctor. Thank you for the continued support to all these children through your contribution. All support from donors is highly appreciated. May god bless you!